Community Supported Agriculture (CSA) supports local farmers with a season long commitment. We offer you FREE HOME DELIVERY and options to CUSTOMIZE YOUR SHARE each week. You buy a “crop share” membership, and every week you receive a share of whatever fruits and vegetables are being harvested that week. It’s a great way to get a regular supply of super fresh produce, priority on limited items, and a chance to try new things that you might not buy at the store. FREE Home Delivery In Our Area? Winter Season starts week of Jan 6. Delivery every 2 weeks. Spring Season starts week of March 17. Delivery every 2 weeks. Summer Season starts week of May 26. Delivery every week. Fall Season starts week of Oct 13. Delivery every 2 weeks. Choose the produce you'd like in your box this week! The Trumpeter Swan Farm CSA is now YEAR-ROUND, with weekly delivery during the summer season (June thru Oct) and biweekly delivery in the other seasons (Nov-May). Eggs can be added on. An Egg Only CSA option is also available. With our year-round focus, we have also decided to become even more flexible, offering "continuous signup" and delivery hold options. You can become a member at any time, buying a season at a time. Each season is priced to reflect the products we give you, with the more prolific summer season priced higher. If the season has already started, you can still sign up and your cost will be PRO-RATED for the remaining of the season. We also offer VACATION SKIPS and SEASONAL HOLDS, giving you a double box the next time, donate to food shelf, or credit for the weeks you do not get a delivery. I know - we are crazy - but we just love the CSA model for providing local food. And now, inspired by Eliot Coleman's "Four-Season Harvest" book and techniques, we want to do the same here in Minnesota. It is so cool to be picking lettuce on a sunny day in December when is cold and snowy outside. And all done without any artificial heat, and thus, no added CO2 to the environment. In 2013, we had high tunnel produce until mid-January. In 2014, our high tunnel produce lasted until end of November, after the unusually cold November descended upon us. We have also tried some hydroponic growing. While our success varies, each year is an ADVENTURE in how long we can have produce grown in Minnesota! We continue our ZERO LANDFILL program. You return all of our packaging and we do something good with it. Some is re-used, others re-cycled and the rest is composted. We offer FREE HOME DELIVERY right to your door, in the Northwest Metro area. Quantities vary by season, with lesser amounts as we start out the growing season. 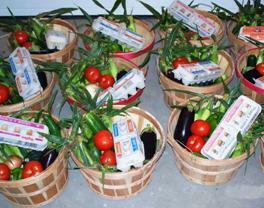 At peak season (August and September), a full share will be about a bushel basket of fruit and vegetables. A FULL SHARE is good for a FAMILY OF FOUR or a VEGETARIAN COUPLE. A half share will be about a half bushel. A HALF SHARE is good for a COUPLE. Our free range brown eggs can be added as desired. We try not to overload you, striving for a little of everything, with a WIDE VARIETY. Half the people who drop a CSA do so because they RECEIVED TOO MUCH and were not able to use it - we all cook less than we think we do. However, the other half drop a CSA because they DO NOT GET ENOUGH - they were thinking lots of stuff for juicing or quantities at a discount. Getting the amount JUST RIGHT is always a balancing act for us. Our Box Customizer lets you choose some of the produce that will be in your box. We allow you to change levels (full to half, or half to full) as needed to get the fine tune your amount. An Egg Only option is also available. You can be assured of eggs week after week even in peak summer months when our eggs normally sell out. Eggs can be added. A full share of eggs is 1 dozen eggs every week, a half share is 1 dozen eggs every 2 weeks. They can be added in increments of one half dozen per week. Egg only CSA members receive free bi-weekly home delivery. You can pay with cash or check, plus we accept credit cards and EBT (food stamp) cards. Our online system makes it easy to signup and monitor your membership. Our farm is owned and operated by Phil Hannay and Kathy Kubal. Along with Ian, our son, and some additional employees, we plant, grow and harvest everything on our farm to insure the highest freshness and quality. Occasionally, we may add some special items grown by a neighbor, by one of our employees, or even by a member. We are bee, butterfly and insect friendly preferring to keep a balance of good and bad bugs. We have prairie and woody areas among our fields providing a lot of diverse habitat for our fellow creatures - some nice (bluebirds and mice), some not so nice (robins and deer) - with all being tolerated as part of a healthy sustainable rural farm. We keep to simple biological practices like cover crops, compost, lighter fertilization, cultivation and mulch, and limited tilling. And if a herbicide or pesticide is needed, we limit them to safe biodegradable ones that require no special safety equipment or licensing and will not contaminate land or water. Your satisfaction is guaranteed. If you have any concerns, just talk to us. We will make it right!